North Korea's asymmetric and urban warfare training capabilities have been the center of intense focus by Kim Jong Un. Nearly every MOUNT (military on urban terrain) facility in the country has been enlarged or upgraded and multiple new sites have been constructed since his rule began. The post-training ruins of the replica Blue House, constructed near Pyongyang in 2016. The country already has a history of constructing mock ups of important buildings like, South Korea's Blue House and defense headquarters. 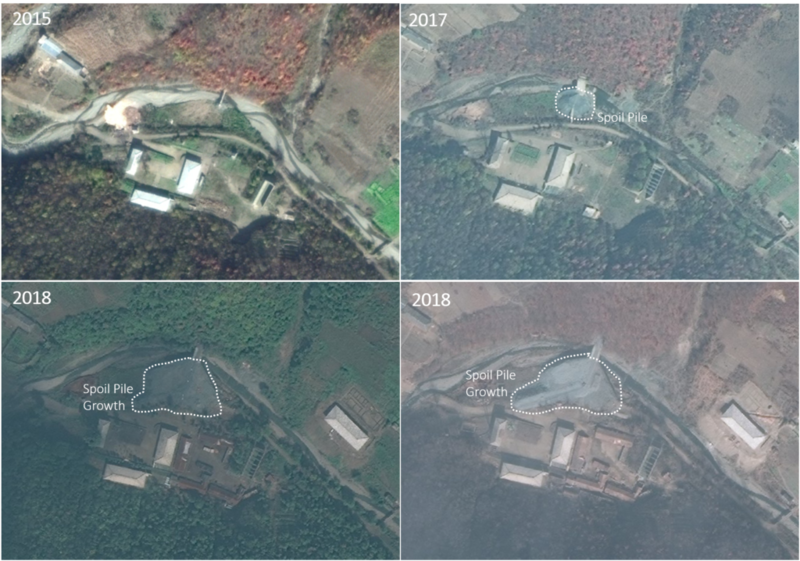 North Korean special forces blew up the mock Blue House during a training exercise in 2016, and in 2017 a replica of South Korea's Gyeryong military services headquarters was spotted at another MOUNT facility near the Yongbyon nuclear facility. Now, a third famous site can be added to the list: Panmunjom. Gyeryong replica building as seen in September 2018. Panmunjom (aka Truce Village, aka Joint Security Area) is a small collection of buildings that straddle the demilitarized zone (DMZ) and is the only place where soldiers from both sides stand face-to-face. If you've ever visited the DMZ, you were undoubtedly taken here. The site was the location of the 1953 Armistice signing and has hosted many diplomatic and military negotiations over the years. While Panmunjom was the site of the 2018 Inter-Korean Summit, which marked the first time a North Korean leader stepped foot into South Korea since the Korea War. The real Panmunjom is located less than 11 km from the North Korean city of Kaesong. The copy is also near Kaesong, a mere 7 km to the northwest, close to the village of Haeson. The copy is built at a small military training base that was constructed around 2006 and has had incremental changes over the years. Locations of the two Panmunjom's in relation to Kaesong. 2019 Google Earth image, annotated by Jacob Bogle. The first satellite evidence of the site is dated Nov. 29, 2017. Well before the Inter-Korean Summit which happened in April 2018. Curiously, on Nov. 13, 2017, a North Korean soldier defected the country and fled to South Korea via Panmunjom. The layout of the site doesn't perfectly match the real place, but there are plenty of similarities - most notably the design of Freedom House and the facade of the Phanmun Pavilion. The purpose of this mock facility can only be guessed at, but it's possible it was a rushed construction to give border guards more accurate training to deal with any possible future defections. It could also serve diplomatic causes by giving dignitaries a place to do trial runs and walk through's prior to visiting the real place. However, the fact remains that it was constructed at a military base and during a time when the Kim regime was enjoying blowing up other important locations. This leads me to believe that there is likely a military purpose for it as well as any theoretical peaceful mission. Monuments usually mark the place of an important event or memorialize important historical figures. But they can also be used to to enforce the ruling regime. Through murals of the gentle leader playing with children (subtly suggesting the regime controls all ages) to massive monuments declaring the absolute power of the party and state, North Korea uses monuments physically stamp its control across the country. However, they're more than just symbols of authority with little part in people's everyday lives. Monuments play a central role in ordering society and maintaining control. Wedding photos are taken next to them, locals are required to pay homage to the Kim's at the monuments on holidays and at other times, and their display and proper upkeep (which is required by law) helps to demonstrate loyalty - which in turn can assist in a town or factory in receiving favors from the government. Various estimates place the number of monuments at up to 34,000. However, the 2017 AccessDPRK Mapping Project, using Google Earth, has established that there is only a fraction of that total in reality. It located 9,896 individual monuments. In 2018 I resurveyed all of those monuments (spending roughly 150 hours on the project). As part of the survey, I classified them by type and was able to located additional monuments. Despite that, I still cannot substantiate the 34,000 estimate and I feel the 2018 survey places restrictions on the maximum number of monuments (it is greater than 10,000, but will not be higher than 15,000, even considering any others I may have possibly missed). With this in consideration, the only realistic interpretation of the 34,000 figure is that it represents the total number of monuments ever constructed, which would include those that have since been demolished, includes memorial plaques (such as on a chair Kim Il Sung may have sat on), or was simply largely based on anecdotal evidence that led to an incorrect figure. The 2018 review found 11,170 monuments (an increase of 1,274). This increase in number over the original 2017 map can largely be attributed to the erection of new monuments and updated satellite imagery which made seeing them more easy. Regarding new statues in the context of Kim Jong Un, all joint statues and murals of Kim Il Sung and Kim Jong Il are "new" in that they were constructed under the rule of Kim Jong Un. In the new file, I have also pointed out selected other monuments that have been erected since he came to power. In total, there have been at least 410 monuments constructed since 2011. For this article, I am only focusing on permanent monuments that are made out of stone or metal. There may be upwards of 1,000 propaganda signs, but many are often transient and may be left to deteriorate. Additionally, there are countless wooden signs placed in fields, at construction sites, and other places which promote whatever propaganda theme is being pushed at the time. These signs are likewise often temporary. North Korea's monuments can be broken down into six main categories: Towers of Immortality, statues of Kim Il Sung and Kim Jong Il, murals of the two Kims, general murals (may feature the Kims, images of daily life, nature, etc. ), general monuments and statues (monuments to an event, ones carrying slogans or sayings, non-Kim statues), and large monuments (such as the Juche Tower). Slogan signs, general murals, and other such monuments all fall within a broader system of generalized monuments and so I haven't given each general monument its own classification label. A key reason for this is the fact that many are small and any detailed identification via satellite is basically impossible. So I have focused on breaking down the monuments into the following major categories: Towers, Kim statues, Kim murals, large monuments, and "others" (which encompasses everything else). This is the primary Tower of Immortality and is located in Pyongyang. Towers located in towns and elsewhere, such as in this example, will have a more simple appearance and will be smaller. This is the Mansudae Grand Monument which features giant bronze statues of Kim Il Sung and Kim Jong Il. While these are the largest statues in the country, smaller statues of the Kim's exist in each provincial capital and at some major institutions. This is the site as seen on Google Earth. Murals of Kim Il Sun and Kim Jong Il at Jangdae, Pyongyang. (Image Source: Commons/Nicor/3.0). Many murals are placed at schools, universities, and factories, and because they are relatively thin (as seen from above), it can be hard to locate them as they may blend in with trees or building facades. Joint KIS-KJI murals are all labeled within the KMZ file "Others". However it also includes all additional murals, which can have a wide range of images painted on them, as well as slogan monuments, which are typically the smallest kind and has various quotes from the leadership and Party, and larger monuments like the monument to the foundation of Korean Worker's Party and Juche Tower. This is an example of an institution that has multiple types of monuments around the grounds. Air Defense and Combat Command, Pyongyang. 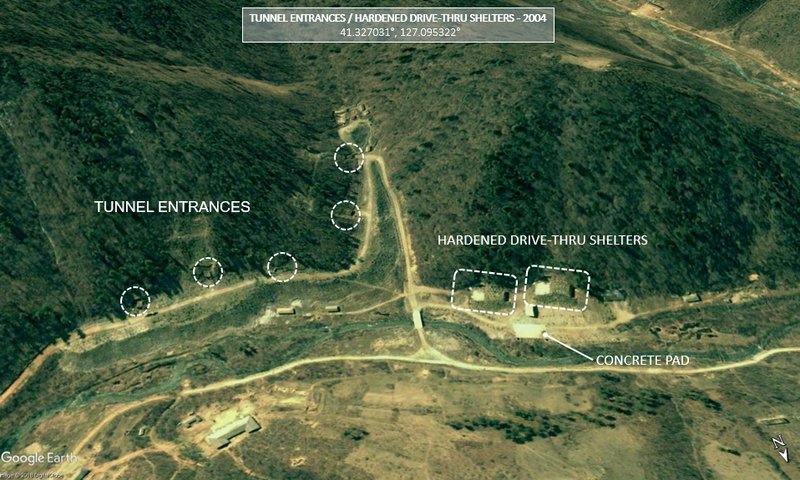 Base image by Google Earth with annotations by AccessDPRK.com. As a general rule, there's one joint statue of the deceased Kim's in each provincial capital and one joint mural in each county seat. Towers of Immortality are placed in every city, town, and village of note, as well as universities and major factories. In most cases, military bases will not have a monument, but some key military schools, headquarter facilities, and other important bases will have at least one monument. North Korea has at least 11,170 monuments, a 13% increase from the 2017 file. Of those, 5,175 are Towers, 29 are joint statues of Kim Il Sung-Kim Jong Il (KIS-KJI), 265 are KIS-KJI joint murals, and 5,701 are various other monuments. While I did not attempt to locate every monument erected since Kim Jong Un came into power, I did determine that there are at least 145 of them (representing 1.3% of the total number of monuments in the country). This doesn't include the joint murals, all of which were erected after the death of Kim Jong Il (usually in the place of the single murals of Kim Il Sung that existed prior). If you take those into consideration, then at least 410 monuments are new. Chagang has 657 total monuments. Of those, there are 346 Towers, 1 is a KIS-KJI statue, and 16 are KIS-KJI murals. There are an additional 294 monuments of various types. N. Hamgyong has 864 total monuments. Of those, 463 are Towers, 1 is a KIS-KJI statue, and 19 are KIS-KJI murals. There are an additional 381 monuments of various types. There is also an example of a demolished monument (not included in the overall counts). S. Hamgyong has 1,295 total monuments. Of those, 690 are Towers, 1 is a KIS-KJI statue, and 26 are KIS-KJI murals. There are an additional 578 monuments of various types. There are also 7 example of a demolished monument (not included in the overall counts). N. Hwanghae has 1,265 total monuments. Of those, 568 are Towers, 3 are KIS-KJI statues, and 25 are KIS-KJI murals. There are an additional 669 monuments of various types. There are also 6 examples of a demolished monument (not included in the overall counts). S. Hwanghae has 1,254 total monuments. Of those, 667 are Towers, 2 are KIS-KJI statues, and 24 are KIS-KJI murals. There are an additional 561 monuments of various types. There are also 9 examples of a demolished monument (not included in the overall counts). Kangwon has a total of 1,073 total monuments. Of those, 444 are Towers, 2 are KIS-KJI statues, and 16 are KIS-KJI murals. There are an additional 611 monuments of various types. There are also 3 examples of demolished monuments (not included in the overall counts). N. Pyongan has 1,252 total monuments. Of those, 637 are Towers, 2 are KIS-KJI statues, and 39 are KIS-KJI murals. There are an additional 574 monuments of various types. There is also an example of a demolished monument (not included in the overall counts). S. Pyongan has 1,497 total monuments. Of those, 673 are Towers, 4 are KIS-KJI statues, and 54 are KIS-KJI murals. There are an additional 766 monuments of various types. There are also 10 examples of a demolished monument (not included in the overall counts). Pyongyang has 1,473 total monuments. Of those, 449 are Towers, 11 are KIS-KJI statues, and 21 are KIS-KJI murals. There are an additional 992 monuments of various types. There is also an example of a demolished monument (not included in the overall counts). Rason has 109 total monuments. Of those, there are 33 Towers, 1 is a KIS-KJI statue, and 2 are KIS-KJI murals. There are an additional 73 monuments of various types. There are also 3 examples of a demolished monument (not included in the overall counts). Ryanggang has 431 total monuments. Of those, 205 are Towers, 1 is a KIS-KJI statue, and 23 are KIS-KJI murals. There are an additional 226 monuments of various types. Below shows the ratios of monuments to population. The population figures are based on the 2008 national census. The annual population growth rate between 1993 and 2008 was 0.84%. That period included a major famine and economic collapse. To estimate current populations, I am going to use growth rate of 10% for the 2008-2018 period, as the economy and food supply situation has improved. Remember, this file has over 11,000 places marked. The file is broken down by province, so in order to not slow down your computer, click on the province you're interested in, or to view the full file, click on each province one at a time. The town of Ichon, Kangwon Province is located a mere 20 miles from the DMZ, and 5 miles east of the town, new facilities have been popping up in the hills of the Kŏnsŏl-li valley. Based on open-source satellite imagery, construction began in 2015 and lasted until late 2017. It includes bunkers, storage sites, and housing facilities. The below image shows the locations of all of the bunkers, storage sites, and some other features. This military base is of brigade size and likely plays a role in the production and storage of various munitions. This 2013 image shows the two small valleys where most of the sites are located prior to any construction. This 2017 image shows the area after construction, with multiple new buildings and 23 new housing units. This 2016 image shows various bunkers under construction. The base has 8 (possibly 9) bunkers, two hardened structures, and at least one underground site. The existence of protective berms between many of the buildings, and the presence of storage facilities suggest that this base is used in the manufacture and/or development of ammunition. There is no apparent testing range, so it is unlikely that this is some kind of training base, which would also require ammunition storage. This new addition may help support other military units in the area. Specific details about this site are sparse, however, it ties into the previous article I wrote on the continued growth of North Korea's conventional forces despite sanctions and talks of peace. Much attention has been paid to North Korea's nuclear weapons, and the focus of recent talks and summits has been to get the country to give them up. However, little to no attention has been given to their conventional military forces which is among the world's largest. 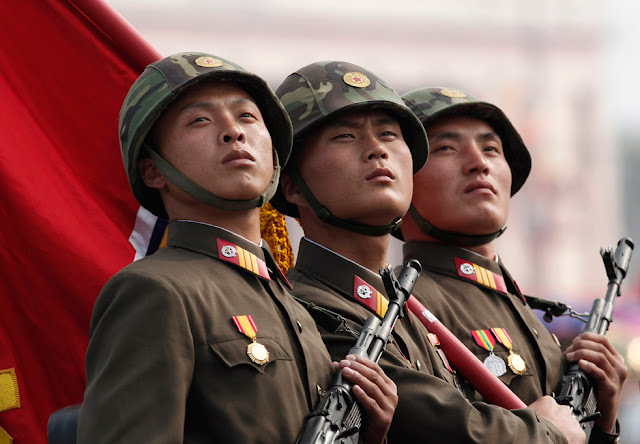 With a million men and women currently under arms, nearly 6 million citizens belonging to paramilitary organizations, 200,000 special forces personnel, 1,600 air defense sites, over 800 underground locations, 700 hardened artillery sites, and thousands of tons worth of chemical and biological weapons, North Korea's conventional military remains an extremely deadly force despite the outdated nature of its equipment. Kim Jong Un has not only accomplished North Korea's long-standing goal of developing functional nuclear weapons and the capacity to launch them at the US through their ICBM program, but he has poured millions of dollars into modernizing the country's conventional forces. This modernization program includes the construction of entirely new bases, the expansion of existing ones, and there has been a large focus on specialized warfare centers like hovercraft bases and military on urban terrain (MOUNT) facilities. An important take away in the face of denuclearization talks is that all of this activity has been happening since Kim took power and it continues to this very day. This article will examine five examples of this to show that Kim's army is marching right along. Under Kim Jong Un, several changes to the country's air force bases and airports have been observed, and I have tried keeping you up-to-date with these changes (see Rockets and Runways and NK's Air Force). However, the changes to the Kyongsong Airbase is one of the most extreme cases of modernization since Wonsan's Kalma Airport was reconstructed at a cost of $200 million. Kyongsong in August 2018 before any construction has begun. By October 2018, the entire airbase had been razed and new facilities are under construction. Kyongsong isn't expected to cost such a grand sum, but the complete reconstruction of the runway and administrative area is a major recent change to the country's military infrastructure. Kyongsong is subordinate to the 8th Transport Division and is the home of an officer's training school. The school, located to the north of the base, isn't currently undergoing any major changes. One of North Korea's newest MOUNT facilities is located 21 km northwest of Haeju. I have written about these facilities before, but this is a large base, was constructed within the last two years, and is located in an area with several other military training bases that have also undergone expansion. 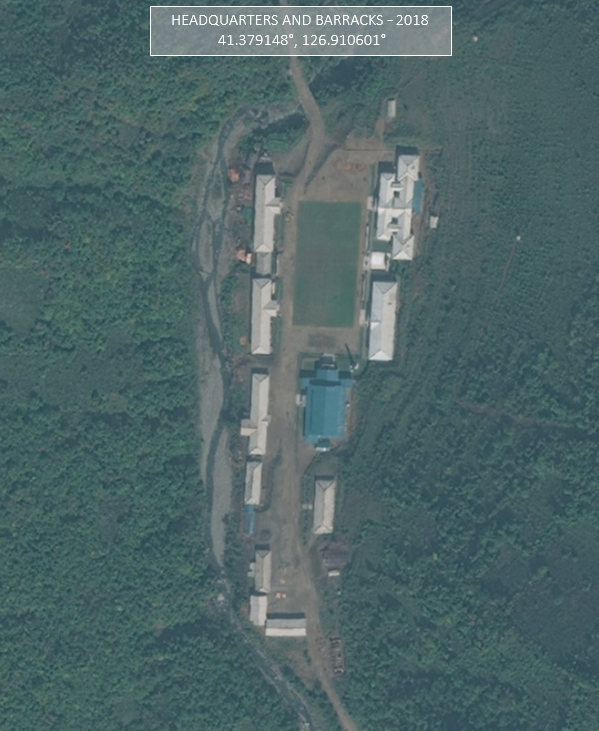 2017 satellite image of the MOUNT facility's location before its construction. The MOUNT facility after its construction. It has three sets of mock buildings used in training activities. A close-up of the mock buildings constructed at the site and another training course. The continued construction of MOUNT facilities, some small and some large like Haeju's, points to the regime's commitment to asymmetric warfare and their dedication to the long-standing policy of supporting the forced reunification of the peninsula under Kim family rule. Yonbong is a hovercraft base under construction that places North Korean military assets within 30 miles of South Korean territory. Located near the city of Songang, South Hwanghae Province, construction of the base began in 2014 and is ongoing. The hovercraft shelters are dispersed around small sea inlets and are built into the sides of low hills, which provides greater protection for the site. According to Joseph Bermudez, this is one of the most forward deployed naval sites North Korea has. While it may take some time before the base is completed, once it is, it will represent a great danger to South Korean islands in the region and to marine traffic. Yonbong facilities under construction in 2015. This image shows multiple years of work at the base, including work done in 2018 which was close to the Kim-Trump summit and despite North Korea's apparent "good behavior" of not testing missiles since 2017. A close-up of the different groups of hovercraft bays. The construction of this new base has been happening at the same time as several other facilities and while the Muncho Naval Base has undergone major upgrades. Munchon, located near the east coastal city of Wonsan, is home to Korean People's Navy units 155, 597, and 291 and houses a large number of hovercraft. Additionally, Kim Jong Un has ordered an increase in the production of high-speed torpedo boats. North Korea currently has over 200 such boats. The combined effect of all of this is the heightened capabilities of North Korea to launch rapid attacks against South Korea and to defend their own borders against any Western allied invasion, thus it poses a risk to American forces in such an event. North Korea has an estimated 20 missile bases. Of those, 13 have been positively identified, and one of them shows substantial recent activity (despite wrongly reported claims that North Korea agreed to halt production of their missiles). The base is Yeongjon-do, located near the Chinese border. Known about for decades, previously unidentified construction has been located at the site and may be a second headquarters facility for an annex of the expanded base. This 2004 image of the older, core base shows five tunnels and two "drive-thru" bunkers where mobile missile launchers could be loaded and deployed. Image from the Center for Nonproliferation Studies (CNS). The area of concern lies 7 miles away. This 2018 image shows the new "headquarters" which was originally constructed in 2014. Image from CNS. Additional activity shows the ongoing construction of a large underground facility. This comparison image shows the growth of a spoil pile (discarded soil and rock) from the excavation of the underground site. Image from CNS. North Korea maintains over 800 underground facilities and tunnels which include sites to protect factories, nuclear, chemical, and biological weapons, missiles, and other important equipment. Based on the images, construction progress has sped up significantly since 2017. Its exact purpose is unknown to the public, but private sector analysts and intelligence agencies are carefully watching the area. Based on an AccessDPRK review of military sites in 2018, North Korea has 58 verified SAM (surface-to-air) locations (with a further three that may actually be dummy sites). This new site may be the 59th, although more recent satellite imagery once the site is completed will likely be needed for a positive identification. North Korea has been working to deploy their version of the Russian S-300 surface-to-air missile system, the KN-06. The KN-06 has a range of 150 km and is vehicle based, unlike their older SAM systems which are launched from dedicated SAM bases. However, the KN-06 can be stored in hardened bunkers until needed as well as kept mobile to avoid detection. This new site is located within the main SAM belt that runs the length of the DMZ and it is placed near major cities and military bases that would need aerial defense. Its general design also somewhat differs from older, more conventional SAM facilities which makes me think it may be a kind "shelter site" (North Korea houses thousands of different missiles and various other equipment in bunkers across the country). Relations between North Korea and the US and South Korea have definitely changed since 2016. But despite the current rapprochement with South Korea and photo-op summits with President Trump, their suspension of nuclear tests, and all of the claims coming from the Trump administration of denuclearization and even hints at general disarmament, the fact remains that North Korea's conventional military is marching right on with no signs of slowing down. These examples show that nearly every other non-nuclear branch of their military is continuing to be developed and countless millions are being poured into modernization schemes. North Korea may have halted the development of new nuclear technology, but their current nuclear and ballistic technology is already more than capable of inflicting great harm on the US and our allies. And regardless of any nuclear halt, Kim Jong Un's army, navy, and air force are even more capable and adaptable today than it was two years ago. Here's what happened with #AccessDPRK in 2018. For every large article or big mapping project, I try to mix in several smaller ones to continue to the goal of exposing North Korea and keeping my readers interested. This year was no different, however, I made the choice to focus more on those bigger items. In 2018 I made eleven posts to this blog (making for 70 posts overall). Three of those this year included either a release of information via Google Earth files or an explorable Google Map. And when you make room for the various images included, these eleven posts represent 85 pages of printable material. The two largest projects I began this year involves the military and the country's monuments. The military project can be divided into two smaller, yet still large in themselves, projects. The first is a complete re-mapping of North Korea's military sites and re-organizing of my file system within Google Earth. I am wanting to take a much more granular look them to provide ever greater levels of detail. While this project will take some time to complete, I have already made over 500 additions to what was included in the Phase II map, and made hundreds of additional changes to the original material as well. The second part of the "military project" involves the country's air defense sites. The current, non-public map that I now have has even more locations identified and updates those older ones that may have become decommissioned, upgraded, or otherwise changed since 2016/2017. Without giving too much away, I am working on a new map specifically for this subject and it will help to give greater-detailed answers to certain questions that are out there. The second major project is also re-mapping the whole country, this time, in regard to the vast numbers of monuments. I have also broken them down into a few specific categories that will be of use to others. One reason I decided to do this is to help resolve a discrepancy between my own findings and the often quoted estimations of others on the number of monuments around the country. It will also give a general idea as to how many new monuments Kim Jong Un has constructed, and offer insights into the amount of effort and money still being dumped in the personality cult at the expense of other sectors. I have completed the mapping portion. Now all I have left to do is write my report on it and publish the KML file, so that will definitely become available in 2019. In terms of social media, it's been a fun year. Traffic to the blog for 2018 was over 600% higher than the first year of having it. I made over 80 Tweets about North Korea that was connected to #AccessDPRK and those garnered over 200,000 impressions. Here was 2018's top Tweet. I'm also proud to say that a GIS company reached out to me for some assistance with one of their projects earlier in the year, and I was able to give it. Additionally, I discovered that the RAND Corporation used parts of the Phase II map to help create their 2018 report, The Korean Peninsula: Three Dangerous Scenarios. It's always exciting to me when I see things being of use to others (when proper credit is given, of course, which is was by RAND). I have still been considering setting up a Patreon page, as I first discussed last year. Well, I've already set it up (not published) but I haven't quite figured out what direction I want to go with it (either to allow people to donate monthly or per article. What kind of rewards to offer, etc.) But considering the amount of time some of these things take (over 150 hours just on monuments), I don't think it's the right way to go to shoulder the full burden of research, buying new books/articles, up-keeping domains, etc. without some support from those most interested. Life does get the way at times, and having some added income would help speed things up and allow me to produce more content. Here's looking forward to another year of shedding light on the Hermit Kingdom! Statue of Kim Il Sung and Kim Jong Il riding horses. Erected in 2012 after the death of Kim Jong Il. For the uninitiated, Juche is the official state ideology of North Korea. It is most commonly translated as "self-reliance". This self-reliance is supposed to mean the self-sufficiency of the state and that "man is the master of the revolution". In reality, neither of these is true. The general concept of Juche has a history that goes back to the 1930s, however, it wasn't until 1982 that Kim Il Sung wrote the main treatise on the subject. Mixing Korean ethnic nationalism with Marxism-Leninism, Juche also helps to support the Kim family personality cult, which is further backed up by the Monolithic Ideology System, which declares that there is no correct thought but the thought of Kim Il Sung, Kim Jong Il, and (now) Kim Jong Un. Through it all, the web of Juche underpins the fabric of North Korea's political and cultural systems. The cult of personality that exists within North Korea is the most extreme and pervasive example that has ever existed. With a genesis that dates to the very foundation of the country, North Korea is strewn with thousands of monuments praising and commemorating the leadership. Its people are taught songs of praise to the Kim family, and important sites have become pilgrimage destinations for millions (as well as mandatory tourist sites). Christianity has Rome. Judaism has Jerusalem. Islam has Mecca and Medina. The Cult of Kim has Mangyongdae, Pyongyang, Hoeryong, Mt. Paektu, and Myohyangsan. There are countless historic and revolutionary sites within North Korea, but those core locations provide the major, real-world backbone needed for the cult, and also helps to support its racialist overtones as the people of Korea are viewed within the cult as the "purest" race in the world, with the purest bloodline leading the revolution. In this article, I want to take a look at the major sites that anchor this Juche republic. Located in the far north of the country, split in two by the borders of China and North Korea, the ancient volcano Mt. Paektu (9,003 ft) holds a special spiritual place in the hearts of all Koreans, north and south. The mountain really is a wonderful place and it is the highest mountain on the Korean peninsula. Lower elevations are covered with dense forests and countless wild animals roam. Higher up, the rich land turns to ice and rock, finally giving way to the enormous crater lake (Lake Chol/Heaven Lake) at the summit, which was formed by an extremely powerful eruption around 946 AD. From this majestic setting, the foundation myth of the Korean people arises. The god-king Dangun is said to have been born on the mountain to his mother, the daughter of a bear and a human, and to his father, the son of the Lord of Heaven. Dangun eventually went on to found what has become known as Korea (Old Joseon) in 2333 BC. This date is celebrated in both Koreas as National Foundation Day, and for over 4,000 years, the people of Korea forged a unique and ever unified identity that was only later shattered by the events of World War II and the Korean War. The mountain's military role also lends itself to the mytho-historical accounts of Kim Il Sung and his band of guerrilla fighters. Mt. Paektu and its geologic offspring, the lower mountains that run down the spine of the country, served as an important historical defensive line. It enabled the construction of many forts and walled cities that helped to defend Korea from invading Chinese, roving bandits, and other outside threats. Kim Il Sung's story here begins with his struggle against Japanese occupation. From the flanks of the mountain he, with his iron-will and band of peerless, peasant worriers, would strike Japanese strongholds, disrupt communication and transportation, liberate towns, and raise an army that eventually defeated the whole of Imperil Japan. The mountain gave them shelter and supplies. It taught them lessons through struggle that made them stronger and wiser. And as the Japanese threat vanished from the Earth, yet while Western imperialism threatened to devour all, it gave him a son: Kim Jong Il. The reality is that Kim Il Sung and his fighters never held more than a moderate-sized village for more than a few hours. Their military threats and ideological assaults on imperialism were never more than an annoyance to the Japanese. But after decades of spin and embellishment, Kim Il Sung, with the divine mandate of Mt. Paektu, all but single-handedly defeated the Japanese, overthrew the old capitalist order by awakening the call to class struggle in the hearts of the people, and eventually created the most powerful nation in the world after defeating the former most powerful, the United States. Likewise, Kim Jong Il (who was actually born in Russia, not on Mt. Paektu), used the mystical nature of the mountain to legitimize his rule. Not only was he the son of Korea, he was the son of Heaven. He was part of a spiritual lineage that dates all the way back to Dangun and the founding of Korea. No true Korean could question him. It is that lineage that, using the broad scope of Juche, enables the regime to suppress minorities, exile the physical and mentally handicapped, and look upon all other races as inferior beings. To them, only Koreans are pure of blood and heart, and that must be defended at all costs by the Paektu Bloodline, the noblest bloodline that ever was. As such an important place, numerous songs and poems have been written about the mountain, and it features in national symbolism, like the National Emblem. The pine tree is even the national tree of the DPRK because of its association with Mt. Paektu and Kim Il Sung's activities there during the Japanese occupation. The nearby city of Samjiyon has been turned into the main stop before visiting the mountain itself. It has multiple monuments, walled of villas, and a secure palace for the ruling Kim. Since 2005, the city has undergone a series of upgrades and it is the intention of Kim Jong Un to turn it into major regional hub by 2020. After all, Samjiyon is the "spiritual hometown of the people" according to government propaganda. Myohyangsan (which translates to "mysterious fragrant mountain") is a mountain along the border between North Pyongan and Chagang provinces. The mountain was the home of the mythical King Dangun after he descended from Mt. Paektu and began to establish Korea. Myohyangsan is another beautiful mountain and has been recognized by UNESCO as a world biosphere reserve for its many endemic and endangered plant and animal species. The mountain is also dotted with century's old temples, graves, and other historic ruins, which tie its current modern use to the past. Nestled in the valley are a set of two large underground museums called the International Friendship Exhibition. These museums hold over 200,000 gifts to Kim Il Sung and Kim Jong Il from people around world. Satellite imagery from 2017 suggests that the museums are undergoing expansion, perhaps to include new gifts being received by Kim Jong Un. Unfortunately, photography inside the exhibition is prohibited, so I can't show you what it looks like indoors. The associated city of Hyangsan (Kuwollim), largely built in traditional Korean architecture, serves as the urban center that helps support the several luxury hotels pilgrims stay at. The existence of these museums (rather, the fact so many gifts have been bestowed on the leadership) is used by the government to prove the supremacy of the Kim family. Countless honorary degrees from questionable universities of the Communist era, an array of now meaningless awards and medals from defunct Eastern bloc countries and former African despots, and all manner of other things from the simple to the magnificent are all to be found here. Citizens (and tourists) are walked through dozens and dozens of rooms being told who, when, and where each item came to Kim Il Sung or Kim Jong Il. The site is used to show how the gifts demonstrate that the ideology created by the Kims is correct and is allegedly seen as important worldwide. The exhibition also helps to instill a sense of community, that North Korea really isn't all alone; rather, it is just the evil capitalists who are trying to destroy the country and to harm "true" freedom loving people around the world. But thanks to the Kims and their tireless work, all people can rest assured in the ultimate victory that is to come - and these items prove it. The recent activity at the museum is also part of an overall improvement of the area. The construction of a new airport and renovated facilities have all occurred under Kim Jong Un. He has spent millions around the country improving the major sites associated with his family and the government. Located nearby is the curious Hagap Facility. Once thought to be an underground nuclear complex, it is now thought by many to be a massive underground repository for the works of the Kims and other important national archives. It, too, has ongoing new construction activities. Pyongyang is the central focus of the cult of Kim and from where Juche emanates. It is the birthplace of Kim Il Sung (in the Mangyongdae neighborhood) and it is the center of government. While residency in the capital is tightly restricted, all North Koreans are expected to make the journey to visit the main sights. These include, the Juche Tower, the premier Tower of Immortality, the birthplace of Kim Il Sung, his eternal resting place (along with that of his son, Kim Jong Il) at the Kumsusan Palace of the Sun, the monument to the foundation of the Korean Workers' Party, the Revolutionary Martyrs' Cemetery, and all must bow before the enormous bronze statues at Mansu Hill. As briefly discussed earlier, Juche is the guiding light of North Korea. Kim Il Sung's explanation of Juche was, "Establishing juche means, in a nutshell, being the master of revolution and reconstruction in one’s own country. This means holding fast to an independent position, rejecting dependence on others, using one’s own brains, believing in one’s own strength, displaying the revolutionary spirit of self-reliance, and thus solving one’s own problems for oneself on one’s own responsibility under all circumstances." Unfortunately, this notionally positive concept was never meant to empower individualism. To honor the invention of the Juche idea and to honor Kim Il Sung's 70th birthday, the Juche Tower was opened in 1982. Standing at 560 feet, the tower contains 25,550 blocks - one for each day of Kim Il Sung's life to that point. The tower is one of the most iconic and popular sights in Pyongyang and, from the top, is the best place to take panoramic photos of the city. The tower serves as a iconographic focal point for the city (as it can be seen across the Taedong River from Kim Il Sing Square) and is the backdrop for parades and mass celebrations. To underscore the importance and claimed universality of the Juche idea, the tower also contains 82 "friendship plaques" from supportive organizations across the world. The birthplace of Kim Il Sung at Mangyongdae carries with it the same importance and sense of awe as Bethlehem does for Christians. Mangyongdae was once a very rural community on the outskirts of Pyongyang, but now that it contains the claimed original birthplace of a demigod, it is a major tourist attraction and has become infused with both a religious and recreational nature. This Revolutionary Site has been a place of pilgrimage since 1947. Kim Il Sung's childhood 1,000 ri (~300 mile) "Journey of Learning" and his other youthful exploits took off from this spot. The site contains not just the house, which is surrounded by green and wooded spaces, but it has been expanded with modern facilities such as the Mangyongdae Revolutionary Museum, a large amusement park, a water park, and is adjacent to the Mangyongdae School where North Korea's next generation of elites are taught. The amusement park can technically accommodate 100,000 people a day, which attests to the area's importance. The house is treated with reverence and as a place of reflection, while the outer areas of parks provide the people with joy and an ability to somewhat let go of their otherwise ridged daily lives. Through the outlook of a North Korean, all of this is provided to them thanks to the love and caring of their eternal father and a gracious state. As is even the case demigods, death tends to follow life. Kumsusan began as a palatial residence and office for Kim Il Sung and was constructed in 1976. Following his death in 1994, it was converted into a mausoleum. Kim Il Sung, still officially the Eternal President, lies in a glass sarcophagus at the heart of the palace. When his holy son, Kim Jong Il, died in 2011, he, too, was placed within the Kumsusan Palace of the Sun. The original construction of the 115,000 square feet palace and the subsequent renovations needed to turn it into an everlasting mausoleum have been reported to have cost a combined $900 million. Visitors are required to pay their respects to the lifelike statues of the gone but not forgotten leaders. The current statues replaced pure white marble ones in 2016. To underscore the fact that Kim Il Sung never truly left the people, thousands of "towers of immortality" were constructed across the country. These local towers are gathering places for holidays, mass celebrations, weddings, etc. People are required to bow as they walk passed them and maintenance of them is of the highest priority. In fact, the towers, as well as major murals and other key monuments, are often the only places that have 24/7 electricity provided and nighttime lighting. Your home may be cold and dark, but you can warm yourself by the glow of the tower. The preeminent 92-meter (301 feet) tall tower in Pyongyang was renovated in 2017. No trip to Pyongyang is complete without a visit to the Workers' Party of Korea Foundation Monument. The WPK was founded in 1949 and serves as the only real political voice in the country. While it is in reality little more than a rubber-stamp body for approving "laws" dictated from on high, the legal system, political activities, education, correct culture and thought, and nearly every other aspect of one's daily life is ultimately controlled by the Party. To be a Party member is to have an easy life and a future for your children. To be denied membership, or worse, ejected, is cast a multi-generational shadow on your family from which they may never recover. Obedience to the KWP is the primary function of every North Korean. The monument was erected to mark the 50th anniversary of the Party's founding. The granite and bronze monument is in the shape of the WPK's emblem; a hammer (workers), sickle (farmers), and calligraphy brush (intellectuals). It lies on the right bank of the Taedong River, across from the Korean Revolution Museum on the left bank. These, in turn, lie upstream from Kim Il Sung Square and the Juche Tower. These form two axis that ties the city together based on the Kim family and the Party. The Revolutionary Martys' Cemetery is the primary cemetery for the leading revolutionaries in the fight against the Japanese. Located near the top of Mount Taeson (which also holds the ruins of an ancient fortress), the cemetery contains the graves of 159 elite figures. It was first established in 1975, but later expanded in 1985. Among the internees are the mothers of Kim Il Sung and Kim Jong Il. Kim Il Sung created his power base around those guerrilla fighters. They helped lend him legitimacy in terms of his military prowess and helped him consolidate power during the early years of the government when multiple factions still existed. Those that are buried here served as steady rocks from which Juche and the Monolithic Ideology System could be established and flourish. The Mansu Hill (Mansudae) Grand Monument is perhaps the most well-known monument in North Korea as it is required to pay homage there for anyone coming to the capital. 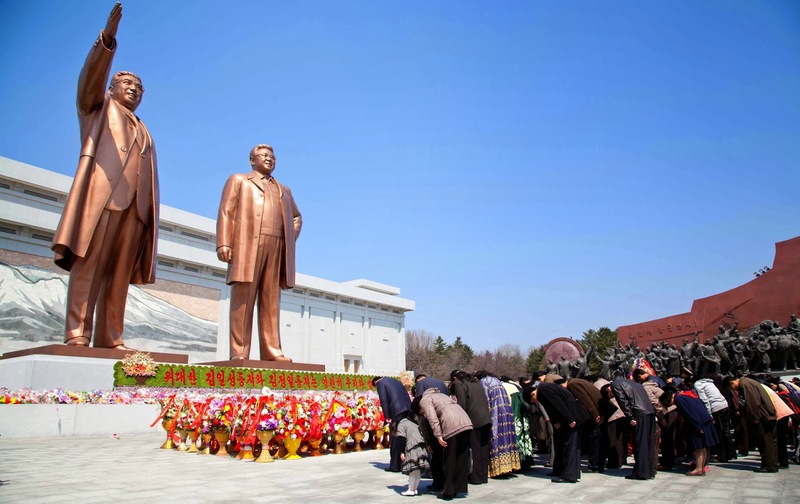 The towering 66-foot bronze statues of Kim Il Sung and Kim Jong Il greet pilgrims with a smile. Everyone who visits is required to bow before the statues and present a small bouquet of flowers. Despite their friendly appearance, the bronzed Kims look on with absolute confidence and power; their scale dwarfing even large groups of people, forcing them to submit. In front of the statues, flanking either side of the square, are two massive Red Flag monuments that remind the visitor that they are in the Juche republic, and that having the correct ideology is the most important thing. Behind the statues is a massive mural of Mt. Paektu that is painted on the wall of the Korean Revolution Museum - another important location to see for any able citizen. The museum was already one of the largest buildings in the world when it was first constructed, but it underwent further expansion and remodeling between 2016 and 2017. The museum underscores the North Korean version of events of the Japanese occupation (which lasted from 1910 to 1945), as well as tells an atypical history of Korea from 1860 through to today. As with all museums in the country, it recounts history through the lens of the lives and philosophy of Kim Il Sung, Kim Jong Il, and other major figures. The fact that North Korea contains the spiritual heart of Korea (Mt. Paektu), Korea's political creation (Myohyangsan), and one of the ancient capitals of Korea (Pyongyang), allows the regime to play up their claim as having the ultimate, nearly divine right to rule over all 75 million Koreans living both north and south. This mindset buttresses the North's longstanding drive to reunify the peninsula under the single rule of the Kim family. Located in the distant northern reaches of the country, Hoeryong is the birthplace of Kim Jong Suk (born Dec. 24, 1917), Kim Jong Il's mother and the grandmother of Kim Jong Un. She died in 1949 as a former guerrilla fighter. Since then, her legacy has become one of being an acclaimed and immortal revolutionary and model mother. She was granted entrance into the noble pantheon of the Three Generals: Kim Il Sung, Kim Jong Il, and herself. As the "Mother of Korea" her life and places associated with her life feature within the Kim family cult and makes her the most prominent woman in North Korea's version of history. Kim Jong Un has spent part of his rule solidifying his own place within the cult, and that means boosting the cults around those he is directly related to to give himself greater legitimacy, as he is still young and is not the firstborn - both of which are important matters within Confucianism. Hoeryong has had monuments and museums for decades, but now the city is largely being rebuilt and the revolutionary sites and history associated with his grandmother are being burnished. The park area dedicated to the life and times of Kim Jong Suk covers approximately 35 hectares (86 acres). Here is Kim Jong Suk's birthplace. A modest, traditional-style peasant's home. The Museum of the Revolutionary Activities of Kim Jong Suk. Kim Jong Suk has additional monuments and murals around the country as well. She is included in the International Friendship Exhibition and her grave is at the Revolutionary Martyrs Cemetery in Pyongyang.